This story was first published by FairWarning.org. It was reported by Myron Levin, Stuart Silverstein and Lilly Fowler, and written by Levin. While there are no exact figures on the extent of wage theft, authorities say it is rampant in such industries as construction, garment manufacturing, restaurants and home health care. The Wage and Hour Division of the U.S. Department of Labor reported in 2012 that of more than 1,800 restaurant investigations it conducted on the West Coast over several years, it found violations in 71 percent. Of more than 1,500 investigations of garment firms, violations were discovered in 93 percent. A landmark survey survey of thousands of low-wage workers in New York City, Los Angeles and Chicago found that 26 percent had been paid less than the minimum wage the week before they were interviewed. According to the 2009 report by the National Employment Law Project and two other groups, 76 percent of the workers who put in more than 40 hours did not get paid or were underpaid the required time-and-a-half overtime rate. 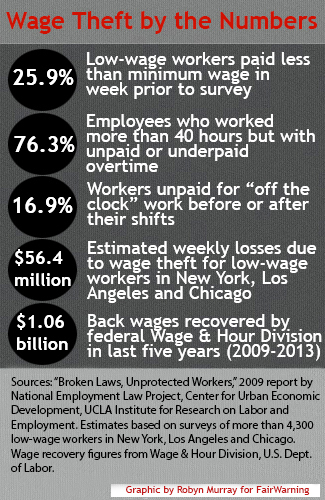 About 17 percent of the workers put in unpaid time “off the clock” before or after their shifts, another violation. In the three cities alone, the study estimated, low-paid workers were losing more than $56.4 million per week to wage theft. One trend– misclassifying workers as independent contractors —is not new but has drawn increased attention as a pervasive feature of the underground economy. Independent contractors are supposed to be people who set their own hours and offer services to multiple clients. But the label has often been imposed as a condition of employment on working stiffs who in no way are running their own businesses. When that happens, the worker loses wage protections, while the employer escapes payment of Social Security, Medicare, unemployment taxes and workers’ comp. The outsourcing of hiring to alleged violators of wage standards has been the focus of a federal class-action suit in Los Angeles against Walmart and three of its contractors and subcontractors. 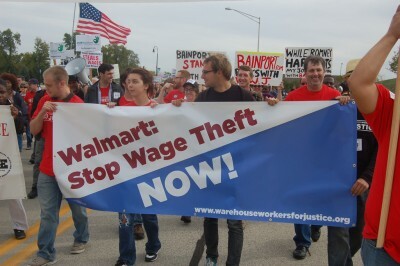 The suit by workers at Walmart-leased warehouses in the Inland Empire region east of Los Angeles claims that Walmart is jointly responsible for employees being “forced to work long hours, under oppressive workplace conditions, for legally inadequate pay.” Walmart says it did not control hiring or pay practices and was not to blame if violations occurred. Under a proposed settlement filed in court this week, one of the Walmart contractors, Schneider Logistics, will pay a settlement to the workers of $21 million, and claims against both Schneider and Walmart will be dismissed. The San Francisco Giants baseball club, which pays its most famous employees spectacularly well, last year agreed to pay more than $500,000 in back wages to dozens of clubhouse and administrative workers the Labor Department said had not received minimum wage and overtime pay. In recent years, scores of fast food restaurants–including McDonald’s franchises in Colorado, Subway stores in Michigan, Ohio and Florida; Dunkin’ Donuts shops in New Jersey and New York; and Domino’s Pizzas in Florida—paid back wages after being cited for such violations as failing to pay employees for all hours worked. In 2011, Farmers agreed to pay more than $1.5 million in back wages to nearly 3,500 call center employees after federal authorities accused Farmers of ‘’significant and systemic violations” of overtime and record-keeping rules. In recent years, major retailers, including Staples, Walmart and Levi Strauss have agreed in settlements to pay millions of dollars in back wages to workers after being accused of improperly exempting them from overtime. Then there’s Urasawa, a Beverly Hills sushi place rated by The Daily Meal as the country’s second most expensive restaurant, with an average tab for two topping $1,100. In February, 2013, the California Labor Commissioner ordered the restaurant to pay back wages and penalties after finding that kitchen workers weren’t getting time-and-a-half overtime pay despite putting in 10½-hour days. The investigation was triggered by a complaint from a long-time employee who said he was fired for asking to leave before the end of his shift because he had a fever and the flu. 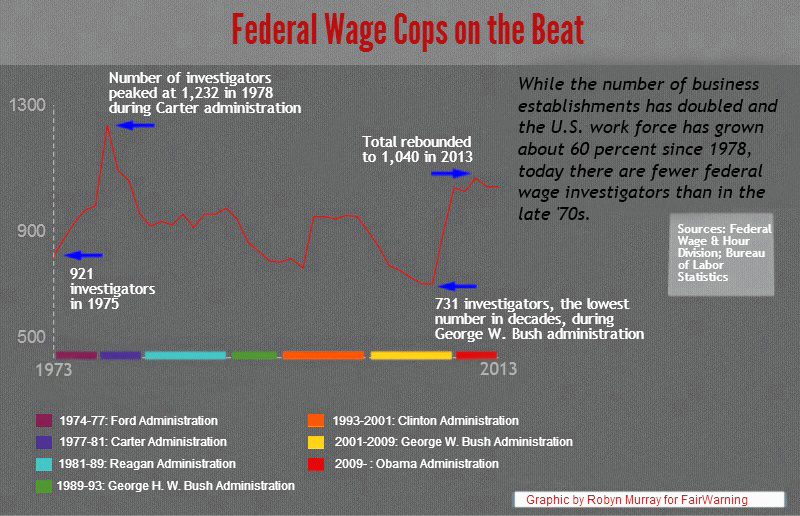 Enforcement, which fell into the doldrums under President George W. Bush, has become more aggressive in the Obama administration, with an emphasis on low-wage industries. But according to experts and advocates, pay violations are so pervasive—and the temptation to cheat so great—that the impact is uncertain. The ranks of Wage and Hour investigators fell sharply under President Bush to 731 in fiscal 2008, the lowest number in decades. The Government Accountability Office assessed the situation and did not mince words: “The Department of Labor has left thousands of actual victims of wage theft who sought federal government assistance with nowhere to turn,” the watchdog agency said in March 2009. Wage and Hour has since added 300 more investigators, and boasts that two-third of its investigators speak at least one language besides English. Even so, the current total of 1,032 is about 20 percent below the high-water mark of the late 1970s, when there were many fewer business establishments than today. “Through reduction in the size and role of the federal and state workplace agencies, employers and industry sectors face a trivial likelihood of investigation in a given year,’’ said a 2010 report prepared for the Wage and Hour Division. For example, the chance of a fast-food restaurant seeing an investigator was about 1 in 12,000 in a given year, while the risk for a garment manufacturer was about 1 in 1,250 (The report’s principal author, former Boston University professor David Weil, was confirmed in late April as the new administrator of the Wage and Hour Division). Private lawsuits seeking back wages for underpaid workers fill part of the gap. However, attorneys are drawn mainly to big-dollar cases–such as overtime class actions for white-collar employees—not to small claims by low-wage workers. Jin Ming Cao, a former restaurant worker in New York City, is due nearly $143,000 in back wages, but knows it’s money he’ll never see. As one of 24 waiters and delivery workers for two Chinese restaurants that violated minimum wage and overtime rules, illegally deducted tips, and forced workers to buy their own uniforms and bicycles, Cao was to have shared in a judgment of more than $1.9 million. Recovering back pay is also a challenge for government agencies. The track record of California, one of the most aggressive states, is particularly striking. Under state law, employees can bring individual wage complaints to a hearing before a deputy labor commissioner. From 2008-2011, workers whose claims were upheld by hearing officers were able to collect back pay in only 17 percent of cases– often because the employer had gone out of business by the time of the hearing, according to a report sponsored by the National Employment Law Project and the UCLA Labor Center. Lumping judgments with settlements in which employers agreed to pay back wages, workers still got only 42 percent of assessed wages. Federal Wage and Hour officials don’t routinely track their collection rate. However, at FairWarning’s request agency officials calculated that of all cases closed in fiscal 2013, they collected 89.9 percent of back wages that employers agreed or were ordered to pay. The rest they were either unable to collect or did not try to recover after employers refused to pay. Another reason for the high percentage is that the collection figures don’t count unsuccessful “conciliations’’—or individual complaints that wage investigators try, but fail, to resolve informally with employers. A $787,000 default judgment against two Los Angeles garment shops is an example of a case that got away. According to court records, the companies had played the shell game of shutting down and reopening under a new name. The first of the companies, JNB 720, Inc., ceased operation in 2010 after being cited for wage violations. Then investigators learned about a new firm, Pop Corn, Inc., with the same owner, many of the same employees and the same illegal pay practices.